Class 2A will not be seeded until Sunday. Play begins Wednesday at Target Center and Williams Arena. The seedings and matchups for three classes of the 106th boys’ basketball tournament were determined Saturday. Click here for brackets for Class 4A, Class 3A and Class 1A. Class 2A won't be seeded until Sunday. 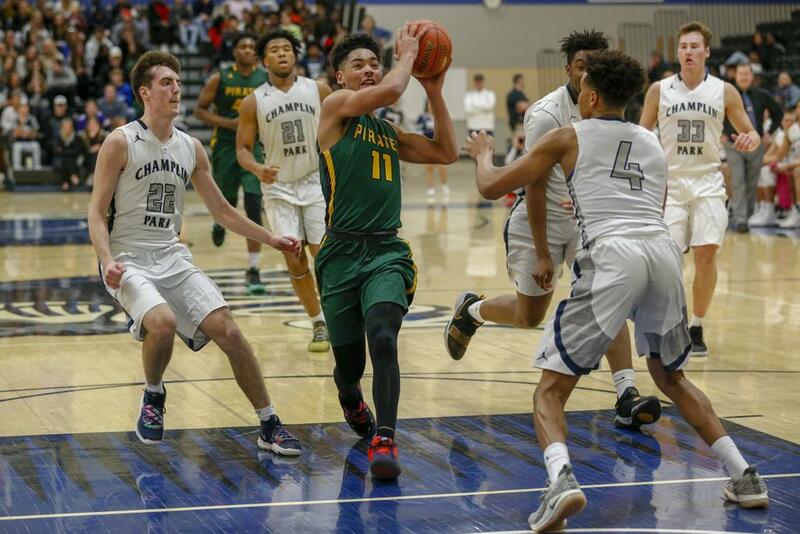 Park Center, fresh from a 57-55 triple-overtime victory over Champlin Park Friday in the Section 5 championship game, earned the No. 1 seed. The Pirates boast the best record in the bracket, 28-1, their only loss to Armstrong in early January. Hopkins, making its 23rd state tournament appearance and first since 2016, was seeded No. 2 despite having regular-season losses to two lower-seeded teams: East Ridge, the No. 3 seed, and Eden Prairie at No. 4. East Ridge will be making its first state tournament appearance. Eden Prairie defeated Hopkins in the final game of the regular season and took down Prior Lake in the Section 2 championship game Friday. Lakeville North picked up the No. 5 seed. The Class 4A tournament is also notable for who won’t be there. Two of the state’s top players, Rochester John Marshall’s Matthew Hurt and Prior Lake’s Dawson Garcia, lost in their respective section finals. Park Center (No. 1, 28-1) vs. Maple Grove, 10 a.m.
Hopkins (2, 24-4) vs. Cambridge-Isanti (17-12), 2 p.m.
East Ridge (3, 27-2) vs. Eastview (18-11), 4 p.m.
Expect points to build up quickly as the bracket features six of the eight highest-scoring teams in 3A: Princeton (84.8 points-per-game average), Waseca (83.8), DeLaSalle (78.4), Mahtomedi (78.3), Holy Angels (75.6) and Austin (72.6). By earning the No. 1 seed, DeLaSalle made it a sweep of the top seeds in Class 3A in state tournament play. The Islanders’ girls team was seeded No. 1 as well. Waseca earned the No. 2 seed thanks to its 28-1 record, the best mark in the field. Waseca’s state tournament history runs deep: The Bluejays won the 1918 state title. Austin picked up the No. 3 seed and earned its 32nd state tournament berth, the most for any school in tournament history. Princeton was seeded No. 4 and will play No. 5-seed Mahtomedi in the first round. Bemidji wasn’t seeded but the Lumberjacks will be making their 30th state tournament appearance and first since 1985. Monticello, which lost seven of its last eight regular-season games, is in despite a sub-.500 record (14-15). DeLaSalle (No. 1, 24-5) vs. Bemidji (23-4), 10 a.m.
Waseca (2, 28-1) vs. Holy Angels (24-4), 2 p.m.
Austin (3, 23-5) vs. Monticello (14-15), 4 p.m. The Class 2A field will not be seeded until Sunday morning because there is one section championship game to be played. Perham and Hawley will meet for the Section 8 championship Saturday at Concordia (Moorhead). The seven teams that have already been determined are Lake City, St. Peter, Redwood Valley, two-time defending champion Minnehaha Academy, Minneapolis North, Melrose and Esko. The quarterfinals will be held Wednesday at Target Center and Williams Arena. Springfield, led by Mr. Basketball finalist Isaac Fink, earned the No. 1 seed. The Tigers are the highest-scoring team in the tournament, averaging 88.3 points per game. Ada-Borup was seeded No. 2 and North Woods, the 2018 runners-up, was seeded No. 3. Henning, making its first tournament appearance since 1966 and third overall, was seeded No. 4. Christ’s Household of Faith, with just 39 students in grades 9 through 12 (according the high school league website) was seeded No. 5. Unseeded Spring Grove, two-time Nine-Man football champions, will be making its first state tournament appearance. Springfield (No. 1, 27-2) vs. Spring Grove (23-4), 11 a.m.
Henning (4, 28-1) vs. Christ’s Household of Faith (23-5), 1 p.m.
Ada-Borup (2, 28-1) vs. Cromwell-Wright (25-3), 3 p.m.
North Woods (3, 27-2) vs. Westbrook-Walnut Grove (23-7), 5 p.m.